I am looking for a pair of navy blue flat slingback shoes in size 9AA. Do you have anything? 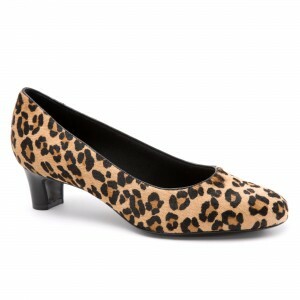 Slingbacks shoes are fabulous options, because of the adjustable ankle strap. 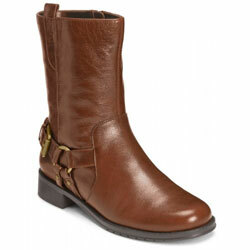 I champion any style that aims towards that perfect fit especially for the narrow women’s foot. I would check back in periodically to view any updated styles. Below you will find a solid choice as a jumping off point. 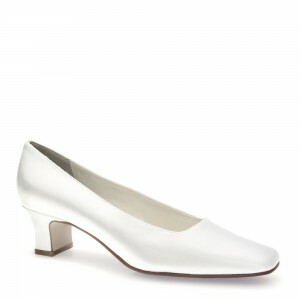 Browse all DesignerShoes.com Narrow women’s Slingback shoes! Strappy shoes look awful on me; peep toe shoes seem way to narrow – I have a wedding to attend and the dress I’m wearing is eggplant in color, and comes just above my knee, some what fancy. Can you suggest something that would look nice? My foot measures 9-1/2 in length, across the toes it is about 3-1/2 wide and the arch of my foot is about 1-1/4 in from the ground. Also a friend says I should wear plain black leather, but I think I should either wear cloth or maybe even patent leather??? Not sure. Eggplant sounds like a beautiful color for the wedding. Black shoes are also good choices (and a wardrobe staple), but I would also look into complementary colors to make what you are wearing pop. In this case it would be yellow or gold in order to highlight the eggplant color. Side note: have you considered an insert for the ball of your foot for peep-toe shoes? It might not be that the shoes are too narrow in the front, but that your foot is being wedged due to slipping forward into the front of the shoe. Francesca by Trotters has intricate embroidery to create a beautiful texture. 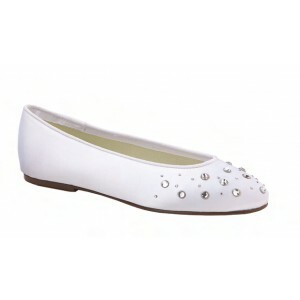 Flats can still be dressy at an event, and a foot saver if you plan on hitting the dance floor! Q: I have searched your site for sandals or slides to fit… but ALL my searches come up with nothing… my shoe size is actually 10-1/2N, but in a sandal or slide I can wear a 10N… I have searched everywhere, to no avail. I am tired of wearing flip-flops for every occasion… they are not very attractive with a skirt or dress… do you have any ideas…? A: Jeanine, I can certainly understand wanting a variety of looks for the summer months, and wearing a style beyond flip-flops! In searching for both 10 and 10.5 narrow, here are a few choices to get you started that will work with both dresses and skirts. Trotters by Shelby has subtle elegant detailing and a soft footbed. Tahiti by Softwalk comes in four colors: Black, Mocha, and Gold Wash, and sports decorative nail heads. Valentina by Naturalizer showcases a metallic shimmer, and an adjustable heel strap for the perfect fit. My summer look for the office needs some sprucing up. For the past few years, I have relied on the same office look, and I am interested in branching out. My summer work look needs some sprucing up. Any ideas for moving closer to sandals, but still appropriate for work? It sounds as though you require something with a covered toe for your office environment. A lighter weight shoe could be the way to go also for those summer months. Here are a few suggestions for you to think about. Here we have a modified take on the ballet flat by Trotters. 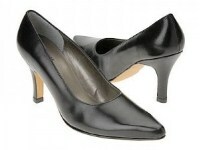 The Jeri shoe has a slingback, which enables more breathing room. South Role by Aerosoles is a slingback pump that comes in green, black, or tan. The cutouts in the toe box add a bit of the risque without sacrificing the career shoe requirements for sobriety. Acalia by Antia is a shoe that gives you a cross between ballet flats and sandals. The pattern paired with solid pants or skirts will make a good balance of textures. My prom is coming in May. Need perfect shoe. My prom is coming up in May, and I’m having trouble finding the perfect shoe. The color of my dress is aqua blue. Do you have any advice on what direction to take? Thank you! Depending on what details your dress has, metallic can be a striking choice. They provide a shiny accent to your outfit without overpowering it. I have included some pictures of possible options. makes it perfect for dancing. It also comes in silver. Anneka by Touch Ups have an elegant jeweled t-strap. Pairing colors is also a good option in making your outfit pop. I would try to avoid tone on tone (i.e. blue dress and blue shoes) ensembles, because they tend to be a little too much like a costume. Mixing can be a great choice once you find a shoe color that complements your dress. Francesca by Trotters carries a yellow lightly sequined slipper that could provide that extra splash of color. It also comes in other colors including violet. You can browse our site by color, and heel height as well to pinpoint your search. Good luck on your search!